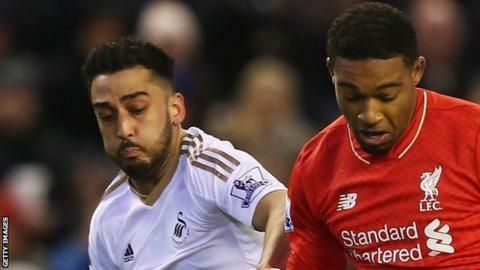 Defender Neil Taylor believes Swansea City "turned a corner" with the manner of their performance in Sunday's 1-0 Premier League defeat at Liverpool. A handball decision against Taylor gave James Milner the chance to earn victory from the penalty spot for the Reds. Taylor believes referee Anthony Taylor was wrong, but felt his side played well despite falling to their ninth league loss in 10 starts. "We played well and turned the corner a bit as a performance," said Taylor. "But we obviously haven't got the result which is disappointing and hard to swallow. "The performance was good, the boys played well and I think overall we can be proud of what we did and we frustrated Liverpool." But defeat meant dropping a place to 15th in the table, one place below Chelsea and four points off the relegation zone. Swansea's plight has led to speculation over manager Garry Monk's future, but Taylor believes the display at Anfield was an improvement. "We got back to how we wanted to play and how we have been playing so we're happy with that," said the Wales international. Taylor felt he was legitimately protecting his face when Jordan Ibe's cross struck his arm, leading to the penalty award. "I don't think the ref was going to give it. Time stood still for about 10 seconds, the crowd shouted loud enough and it's a pen," lamented Taylor.